Many investors believe that owning a portfolio of large- and small-cap stocks provides sufficient exposure across the market-cap spectrum. However, adding a mid-cap allocation to the mix may improve portfolio performance and mitigate risk over time. See for yourself. Use this interactive tool to compare the return and risk (standard deviation1) of a baseline portfolio of large- and small-cap stocks vs. a portfolio including mid-cap stocks, when invested in market indexes over different time periods since 1998. 1 Standard deviation calculation for periods of three years or longer is available with this tool. Standard deviation measures the variability of returns around the average return for an investment portfolio. Higher standard deviation suggests greater risk. Calculated returns are cumulative. Calculated standard deviation is annualized. Mid-cap stocks have proven to be a positive addition to a diversified portfolio of equities, both in terms of boosting portfolio return and lowering risk. 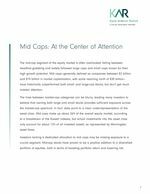 Investors lacking a dedicated allocation to mid caps may be missing exposure to a crucial segment. Read this paper to learn more. Past performance is not a guarantee of future results. The indexes are unmanaged, returns do not reflect any fees, expenses, or sales charges, and they are not available for direct investment. Allocations are for illustrative purposes only and are not representative of any Virtus strategy. Portfolios do not reflect rebalancing. Equity Securities: The market price of equity securities may be affected by financial market, industry, or issue-specific events. Focus on a particular style or on small or medium-sized companies may enhance that risk. Market Capitalization, or market cap, is calculated by multiplying a company's outstanding shares by its stock price. As generally defined, the market cap range for small caps is $300 million to $2 billion, $2 billion to $10 billion for mid caps, and $10 billion to $200 billion for large caps. Small-cap stocks tend to be more volatile (and therefore riskier) than mid- and large-cap stocks. Mid-cap stocks tend to be more volatile than large-cap stocks but less volatile than small-cap stocks. Large-cap stocks tend to be less volatile than mid- and small-cap stocks. Industry/Sector/Asset Class Concentration: A portfolio that focuses its investments in a particular industry, sector, or asset class will be more sensitive to conditions that affect that industry, sector, or asset class than a non-concentrated fund. There is no guarantee that a diversified portfolio will outperform a non-diversified portfolio, or that diversification among different asset classes reduces risk. Russell 1000® Index: A market capitalization-weighted index of the 1,000 largest companies in the Russell Universe, which comprises the 3,000 largest U.S. companies. Russell Midcap® Index: A market capitalization-weighted index of medium-capitalization stocks of U.S. companies. The index is calculated on a total return basis with dividends reinvested. Russell 2000® Index: A market capitalization-weighted index of the 2,000 smallest companies in the Russell universe, which comprises the 3,000 largest U.S. companies. The index is calculated on a total return basis with dividends reinvested. S&P 500® Index: A free-float market-capitalization weighted index of 500 of the largest U.S. companies that measures the performance of the large-cap segment of the market. The index is calculated on a total return basis with dividends reinvested. S&P MidCap 400® Index: A free-float market-capitalization weighted index of 400 mid-cap U.S. companies that measures the performance of the mid-cap segment of the market. The index is calculated on a total return basis with dividends reinvested. S&P SmallCap 600® Index: A free-float market-capitalization weighted index of 600 small-cap U.S. companies that measures the performance of the small-cap segment of the market. The index is calculated on a total return basis with dividends reinvested.